The summer months are all about creating exceptional experiences: from lounging at the pool, enjoying picnics in the park to relaxed lunches with friends and family, as the temperature rises, so does our desire to seek out summer adventures. Making unforgettable memories is thirsty work, and nothing beats the heat quite like a deliciously refreshing iced coffee. As this is such a simple way to enjoy coffee, the quality of the coffee is paramount. To help you create your perfect summer experience on the rocks, Nespresso is launching two Limited Edition Sicilian-inspired coffees, especially designed to be enjoyed over ice: Ispirazione Salentina and Ispirazione Shakerato. After all, no one does coffee quite like the Italians. Brewing hot coffee over ice is said to preserve the delicate flavours of the coffee. Iced pour-over tends to be lighter, more delicate, more nuanced and really amplifies the taste experience. By brewing over ice, you can either make a big pitcher for friends, or a single glass for yourself when you need a caffeine kick. Remember, ice is an ingredient, too. Add a little pizazz to your iced coffee by making special iced cubes: create a simple syrup; freeze a few fresh herbs such as lavender, basil or mint in water; or create sweetened condensed milk or melted chocolate cubes for a sweet treat. Believe it or not, citrus and coffee makes a great match. It gently bumps up the natural acidity in coffee. Pour your espresso over a couple slices of lime and some ice and you’ve got yourself a Guillermo. You can also spice up your coffee with a cinnamon stick or a dash of nutmeg. Surprise your friends with a bit of flair by shaking your brew up in a shaker. 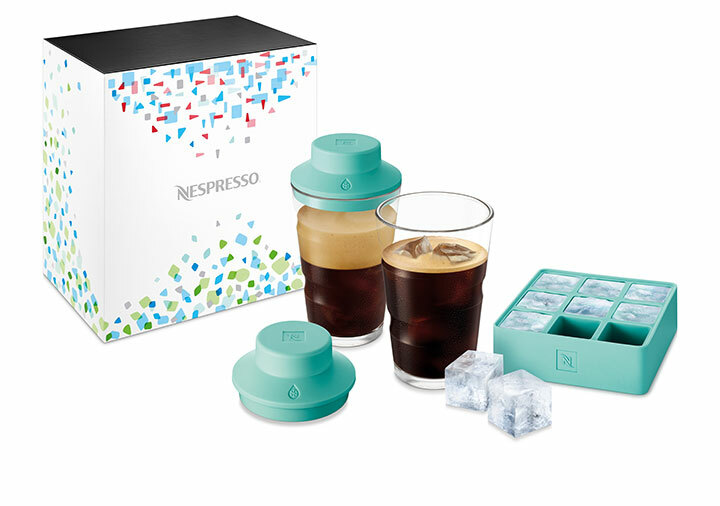 In conjunction with Limited Edition iced coffees, Nespresso has released the View Shaker Mini Kit, which includes a VIEW recipe glass and silicon lid and enables you to shake and mix the ingredients like a barista. Ispirazione Shakerato (25ml & 40ml) – A full bodied, smooth iced coffee with cocoa aromas and long lasting roasted notes. Ispirazione Salentina (25ml & 40ml) – A bold coffee with a smooth and round texture, revealing nutty aromas together with roasted notes. Creating your ideal summer experience has never been easier, thanks to Nespresso. Nespresso Limited Edition Ispirazione Salentina and Ispirazione Shakerato are available now from Nespresso Boutiques and Booths nationwide, as well as through orders from the Nespresso Club on 0800 637773 or online at www.buynespresso.com.